Cambridge, Mass. – January 28, 2014 – Scientists at Harvard University and the Marine Biological Laboratory (MBL) hope new understanding of the natural nanoscale photonic device that enables a small marine animal to dynamically change its colors will inspire improved protective camouflage for soldiers on the battlefield. The cuttlefish, known as the "chameleon of the sea," can rapidly alter both the color and pattern of its skin, helping it blend in with its surroundings and avoid predators. In a paper published January 29 in the Journal of the Royal Society Interface, the Harvard-MBL team reports new details on the sophisticated biomolecular nanophotonic system underlying the cuttlefish’s color-changing ways. "Nature solved the riddle of adaptive camouflage a long time ago," said Kevin Kit Parker, Tarr Family Professor of Bioengineering and Applied Physics at the Harvard School of Engineering and Applied Sciences (SEAS) and core faculty member at the Wyss Institute for Biologically Inspired Engineering at Harvard. “Now the challenge is to reverse-engineer this system in a cost-efficient, synthetic system that is amenable to mass manufacturing." In addition to textiles for military camouflage, the findings could also have applications in materials for paints, cosmetics, and consumer electronics. The cuttlefish (Sepia officinalis) is a cephalopod, like squid and octopuses. Neurally controlled, pigmented organs called chromatophores allow it to change its appearance in response to visual clues, but scientists have had an incomplete understanding of the biological, chemical, and optical functions that make this adaptive coloration possible. To regulate its color, the cuttlefish relies on a vertically arranged assembly of three optical components: the leucophore, a near-perfect light scatterer that reflects light uniformly over the entire visible spectrum; the iridophore, a reflector comprising a stack of thin films; and the chromatophore. This layering enables the skin of the animal to selectively absorb or reflect light of different colors, said coauthor Leila F. Deravi, a research associate in bioengineering at Harvard SEAS. "Chromatophores were previously considered to be pigmentary organs that acted simply as selective color filters,” Deravi said. “But our results suggest that they play a more complex role; they contain luminescent protein nanostructures that enable the cuttlefish to make quick and elaborate changes in its skin pigmentation." When the cuttlefish actuates its coloration system, each chromatophore expands; the surface area can change as much as 500 percent. The Harvard-MBL team showed that within the chromatophore, tethered pigment granules regulate light through absorbance, reflection, and fluorescence, in effect functioning as nanoscale photonic elements, even as the chromatophore changes in size. 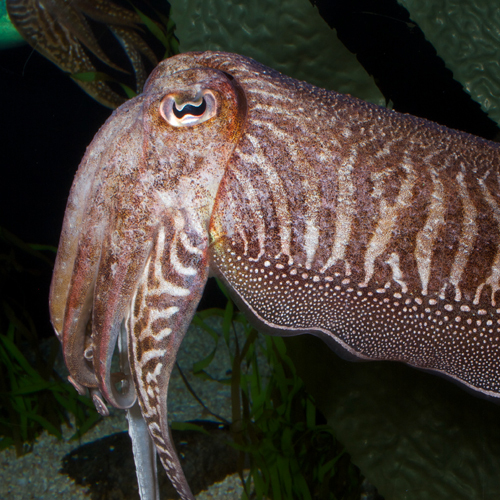 "The cuttlefish uses an ingenious approach to materials composition and structure, one that we have never employed in our engineered displays," said coauthor Evelyn Hu, Tarr-Coyne Professor of Applied Physics and of Electrical Engineering at SEAS. "It is extremely challenging for us to replicate the mechanisms that the cuttlefish uses. For example, we cannot yet engineer materials that have the elasticity to expand 500 [percent] in surface area. And were we able to do so, the richness of color of the expanded and unexpanded material would be dramatically different—think of stretching and shrinking a balloon. The cuttlefish may have found a way to compensate for this change in richness of color by being an 'active' light emitter (fluorescent), not simply modulating light through passive reflection." The team also included Roger Hanlon and his colleagues at the Marine Biological Laboratory in Woods Hole, Mass. Hanlon’s lab has examined adaptive coloration in the cuttlefish and other invertebrates for many years. "Cuttlefish skin is unique for its dynamic patterning and speed of change," Hanlon said. "Deciphering the relative roles of pigments and reflectors in soft, flexible skin is a key step to translating the principles of actuation to materials science and engineering. This collaborative project expanded our breadth of inquiry and uncovered several useful surprises, such as the tether system that connects the individual pigment granules." For Parker, an Army reservist who completed two tours of duty in Afghanistan, using the cuttlefish to find a biologically inspired design for new types of military camouflage is more than an academic pursuit. He understands first-hand that poor camouflage patterns can cost lives on the battlefield. "Throughout history, people have dreamed of having an 'invisible suit,'" Parker said. "Nature solved that problem, and now it’s up to us to replicate this genius so, like the cuttlefish, we can avoid our predators." In addition to Parker, Hu, Hanlon, and Deravi, the coauthors of the Interface paper are: Andrew P. Magyar, a former postdoctoral student in Hu’s group; Sean P. Sheehy, a graduate student in Parker’s group; and George R. R. Bell, Lydia M. Mäthger, Stephen L. Senft, Trevor J. Wardill, and Alan M. Kuzirian, who all work with Hanlon in the Program in Sensory Physiology and Behavior at the Marine Biological Laboratory. This work was supported in part by the Defense Advanced Research Projects Agency, the Nanoscale Science and Engineering Center at Harvard supported by the National Science Foundation (NSF), the NSF-supported Harvard Materials Research Science and Engineering Center, and the Air Force Office of Scientific Research.